Info Straight shots fly fast! Compete for the highest score by hitting the ball onto the opponent's side of the table. 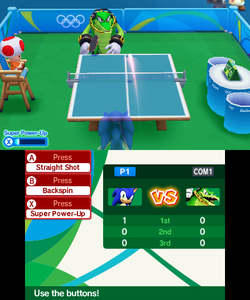 Table Tennis is an Event that appears in the Nintendo 3DS version of Mario & Sonic at the Rio 2016 Olympic Games. The objective of the event is to score a set number of points before the opponent. The playable characters in this event are Mario, Luigi, Ludwig, Sonic, Vector, Zazz and Mii, with Zazz being unlocked by beating him in Table Tennis Plus on the second day of Sonic's story in the Road to Rio mode. A Toad and a Chao appear as referees in this event. In the Road to Rio mode, Table Tennis appears as the vent on day 2 of Sonic's story. In this event, the player only plays one match, which guarantees them either a gold or silver medal, although before the medal ceremony a four person tournament is shown, implying that the player and their opponent have already beaten the two other characters. The player must start the event by either returning a serve from the opponent or serving the ball themselves. The service changes every two points. To serve the ball, the player must press either or once to toss the ball, and must then press it again when the ball reaches the correct height to serve it. If the player serves the ball when it glows, they will be able to perform a fast serve which is harder to return. To return the ball when it has been served, the player can either use to perform a faster straight shot, which will give the ball a yellow glow, or to perform a shot with backspin which slows down with each bounce and has a blue glow. The player must also move towards the ball using either the directions on the Control Pad or Circle Pad, as they will not be able to hit the ball if they are not close enough to it. The better the player's timing when performing a shot, the faster the ball will be returned. If the player returns a shot with bad timing, the ball will have a purple smoke effect and if returned using a straight shot when the ball lights up will allow the ball to be returned with a fast and hard to return smash shot. To score a point, the player must hit the ball past the opponent, and to win a game the player must score a set amount of points. However, if both characters end up with a score one less than the total required number of points, they will end up in a deuce and one character must then take a two point lead to win the game. Over time, the player will charge a meter by returning shots to be able to use a Super Power-Up, which is activated by pressing . The meter charges faster if the player is losing, and charge is carried over between games if more than one are required to win the match. Once activated, all of the player's shots will be returned as fast smash shots with a unique effect depending on the character for a limited time, shown by the meter depleting. If the player is losing when it is used, it will deplete at a slightly slower rate. In this event, the player can set the number of game required for a win to either one, three or five, and the number of points required to win each game to either 5, 11, or 21. When the ball you're tossing lights up, make the serve right away to perform a fast serve. During a Super Power-Up, you can hit all ball back as smashes as long as you don't miss them. If an opponent floats you an easy ball, hit it with perfect timing to perform a smash. A shot with backspin slows down when it bounces! Use it to throw your opponent's timing off. This page was last edited on March 3, 2019, at 04:10.